Long-sleeved polo shirts are the obvious choice if you are looking for a top that both looks professional and feels comfortable to wear. Here at MASCOT we offer long-sleeved polo shirts in 100% cotton that absorb moisture and feel soft and comfortable against your skin. 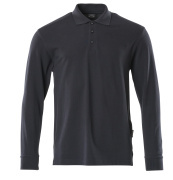 MASCOT also offers long-sleeved polo shirts with a modern fit. Tops with this kind of fit sit more closely to the body compared with a classic fit, but always retain and ensure great freedom of movement at all times. Choose a modern fit if you want a professional look that gives you plenty of space around the arms, shoulders and chest. In addition to long-sleeved polo shirts, MASCOT's assortment also includes a wide selection of T-shirts and jumpers with a modern fit. MASCOT's long-sleeved polo shirts are made from pique, which is a classic fabric used for polo shirts and T-shirts. This choice of fabric quality makes our long-sleeved polo shirts very durable and moisture-absorbing, meaning that they will last for a long time. For increased comfort, the polo shirt has extra padding over the seam at the neck, ensuring that the seam does not cause any irritation. The ribbed cuffs ensure that the sleeves always sit as they should. 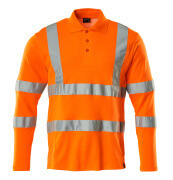 If you need to be extra visible when on the job, then MASCOT also offers long-sleeved polo shirts in fluorescent colours which are certified in accordance with EN ISO 20471. Wearing a polo shirt in a hi-vis colour will guarantee you remain visible when working in risky areas. And at night, the attached reflectors will help to increase your visibility even more. The reflectors do not restrict your freedom of movement as they are made from elastic materials. The inside part of our polo shirts are made from soft cotton, ensuring optimal comfort. If visibility is your absolute priority, then combine your polo shirt with trousers made from fluorescent materials.